Displaying 151 to 200 (of 205 products)	order by Products Name. ApoC2 protein was purified using a a proprietary chromatographic technique. ApoC3 protein was purified using a a proprietary chromatographic technique. 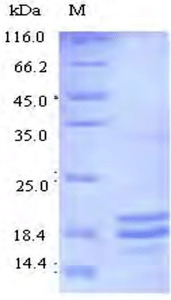 > 95% pureApoJ protein was purified using a a proprietary chromatographic technique. ELISA (EIA) Other applications have not been tested. The optimal dilutions should be determined by end user. Multi-step precipitation Product is 0.2um filtered. ELISA (EIA)Other applications have not been tested. The optimal dilutions should be determined by end user. >95% pure (SDS-PAGE). Column chromatography Single arc by IEP against whole human serum. Greater than 95% as determined by SDS PAGE. Apotransferrin protein was purified using a a proprietary chromatographic technique. > 98% purePurified using a proprietary chromatographic technique.